A Thought Shared ....: The most visited.. This is the 7300 ton, 18038 piece, most recognized and visited landmark in the world. It is, of course, La Tour Eiffel, Paris, France, except that it was so very nearly not Paris. Eiffel, the designer, had plans to construct it as part of the 'Universal Exposition' held in Barcelona, Spain in 1888. It was refused by the Spanish, so it was decided to construct it as part of the Centennial celebrations of the French revolution, 1889. Regarded by many at the time as an eyesore, it had a permit to stand for only 20 years, but this was extended for one reason after another, and as a result is still with us today. It would be difficult to imagine Paris without it. Question: How does one follow an act like this for the bi-centennial celebration of 1989. Try a 71 foot high steel and glass pyramid in front of the world's most visited art gallery. 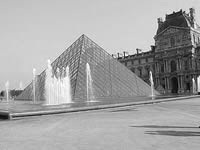 It is now an integral part of the entrance to la Louvre, and there are no plans to demolish it. Not surprizingly, it was regarded as an eyesore by many Parisiens and others, and even though it is a very different style to the majestic building in front of which it stands, one has to admire the City of Paris for once again pushing the boundaries of good taste beyond the sensible, and still getting away with producing yet another of the worlds most visited structures. So, what was the City of Paris 'Arcane Structures Department' doing in the interim? 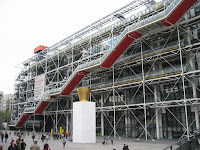 In 1971, construction was begun on the Centre Georges Pompidou. It was to become the home of the Bibliothèque publique d'information, a vast public library, and the Musée National d'Art Moderne. Some 6 years later, it was declared finished. Oh, mais non! Where are the outside walls? Some Parisiens were not exactly enthused by the fact that the 'plumbing' and metal structuring was left exposed. Not only were they exposed, they were also painted in bright colors that differentiated water, electricity, air conditioning, elevators, and ventilation shafts. The effect, however, produced a totally uncluttered interior, and is a classic case of the means justifying the end. It has been accepted now, and is yet one more Parisien landmark that attracts huge numbers of visitors yearly. La Place Georges Pompidou, the area seen in front of the building, is the stage for street performers such as mime artistes and jugglers.